Seems like everyone is hopping on the tablet train before it's too late. Google announced their latest entry into the tablet market today at their developers conference, Google I/O. The new 7-inch Google Nexus 7 tablet will run the freshly released version of Android 4.1 Jelly Bean. Priced at a mere $199, identical to that of Amazon's own tablet, the Kindle Fire, we should expect promising results from Google's latest release. Featuring a 1.3 GHz Nvidia Tegra 3 chipset with quad-core CPU and a 12-core GPU, the Google Nexus 7 plans to pack a punch when it comes to its functionality. To display all of that will be a 1280-by-800 IPS display with scratch-resistant Corning glass. To top everything off is 1 GB of RAM, a micro-USB port, and a 1.2 megapixel front facing camera. This potential "Kindle Fire killer" weighs in at 0.7 pounds and measures out to be 10.45mm thick. As for connectivity you can come to expect the usual GPS, Bluetooth, 802.11b/g/n WiFi, and NFC capabilities. Google promises up to 8 hours of content consumption from a 4325 mAh battery. Alongside with Google's latest and greatest hardware, they announced enormous updates to their software features as well. Google Play will now become the central hub for all of your entertainment content, ranging from music, movies, games, books, and much more. Using your Google account, Google Play will be able to store everything in one place, similar to an Apple ID account. By taking advantage of the cloud, all of your purchases and data can synced wirelessly throughout all of your devices as well. You can preorder your Nexus 7 today on Google's website for $199 for the 8GB version and $249 for the 16GB version. While this tablet does not plan to challenge what Apple has created with the iPad, the Nexus 7 looks to take a grab at what the Kindle Fire has started. Catch the video after the jump! You can never get enough of gadgets being dropped to the ground until something breaks. The guys over at GizmoSlip thought they should put the Amazon's Kindle Fire against Barnes & Noble's Nook Tablet in a drop test showdown to see which of these budget tablets will last the longest in the hands of careless consumers. 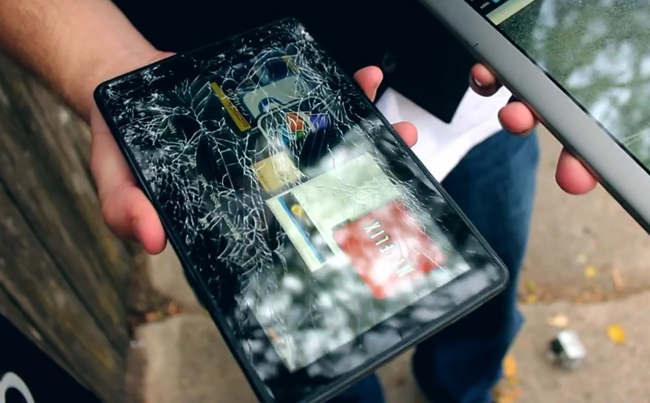 The Kindle Fire's Gorilla Glass screen against the Nook Tablet's less strengthened glass screen and chubby plastic bezel. What we learned from this scientific testing is that although the Kindle Fire is better put together than the Nook Tablet, the Kindle Fire's seamless glass screen is its weakest point. Check out the video down below! If you are an iPad owner there is such a wealth of accessories out there for you that it can be overwhelming. If you own someone else's tablet...not so much. 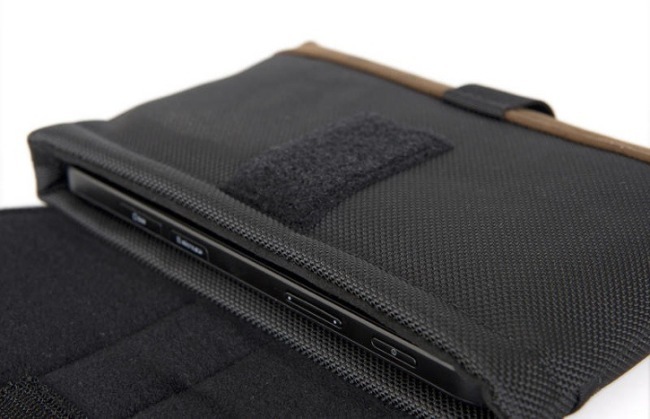 WaterField knows that you love your tablet just as much, so they will make a custom fit case for your tablet no matter what the dimensions or how off the beaten path it is. Of course, they love your iPad too! They have a host of tablets that they already have specific sizes for in the Ultimate Sleeve Case, so you may not have to wait for a custom case at all. Delivery time is about a week on a custom made case and prices range from $49 to $55 with options for additional accessories. WaterField can be found on the web at www.sfbags.com. Well what do you know, starting tomorrow, you can score yourself a 16GB HP TouchPad running the sleek WebOS for only $400 while the 32GB will run you $500, that's $100 off the regular retail price. Does this mean HP is having a hard time selling the TouchPad when you've got a tablet leader such as the iPad around? That's generally the consensus when prices are reduced. HP does state that the price reductions are just for a limited time only. So if you want to score yourself a TouchPad, now is the time. Head on over to HP's TouchPad offer page for more. Now if only Apple slashed prices on their products. This neat little accessory called the Wingstand, takes advantage of your existing Apple Wireless Keyboard and attached to it in order to marry your iPad, tablet, eReader and even a smartphone into a touchscreen working horse. The Wingstand is possibly the tiniest and most portable stand solution we've ever seen before. Of course you can always get one of those keyboard cases, but the Wingstand was created for those who already have all the parts necessary in making their own Multi-Touch computer on the cheap. Wingstand even works with most incased tablets and smartphones so you'll always stay safe and protected. Your gadget will that is. Even Apple's Smart Cover, although that really defeats the purpose of having a Smart Cover isn't it.